What is Astigmatism? Can LASIK Eye Surgery Correct the Problem? Home Lasik Surgery What is Astigmatism? Can LASIK Eye Surgery Correct the Problem? Astigmatism is a common eye problem, where the eyeball isn’t perfectly round. It may be slightly football-shaped or look like the back of a spoon instead, which can cause blurred vision. Light entering a normal eye is bent evenly for clear vision, but an irregularly shaped cornea or lens can cause it to bend more in one direction.Since light doesn’t focus on the retina properly, objects may seem blurry, wavy or out of focus, especially at a distance. Astigmatism causes distorted or blurred vision to some level at all distances. The person will experience eyestrain, difficulty in viewing at night and headaches especially after reading or doing any visual task for an extended period. Squinting is another symptom which is commonly seen in people with Astigmatism. What Causes Astigmatism and How Is It Diagnosed? Astigmatism takes place when the surface of the cornea or the inner curve of the eye lens is shaped irregularly or changes over time. This often happens during adulthood, but the exact cause is unknown. The condition can be inherited, and is usually present right from birth. Astigmatism may increase or decrease as you age, occur after eye surgery, disease or injury, and even be followed by the development of cataracts. It may also be caused by keratoconus, a condition where the cornea thins and becomes cone-shaped over time. A comprehensive eye exam is the only way to diagnose astigmatism, but look out for symptoms such as blurriness, difficulty reading or changes in vision. Refractive eye errors such as nearsightedness/farsightedness can also occur along with astigmatism, and your eye doctor can conduct a variety of tests to find the problem. Myopic Astigmatism– One or both central meridians of the eye are nearsighted. If both the meridians are nearsighted, they are myopic in varying degrees. Hyperopic Astigmatism– One or both central meridians are far-sighted. Mixed Astigmatism– One central meridian is nearsighted and the other is farsighted. Astigmatism can also be categorized as regular and irregular. Regular Astigmatism is when the central meridians are 90 degrees away (vertical to each other). In irregular astigmatism, the central meridians are not vertical to each other. Most of the people with astigmatism have corneal astigmatism, which gives the anterior surface of the eye an oval shape. Irregular astigmatism is either the result of an eye injury that has scarred the cornea or keratoconus, a disease that causes a gradual tapering of the cornea or the aftermath of an eye surgery. Is Eye Surgery Necessary for Treating Astigmatism? Depending on the degree of astigmatism and your eye health, your optometrist could suggest various options for vision correction. Surgery isn’t always necessary, but it can help you regain clear vision if you have severe astigmatism. If you have slight astigmatism with no vision issues, you may not require any treatment at all. Eyeglasses and contact lenses can correct vision problems caused by moderate cases of the condition. Single-vision glasses with a cylindrical lens provide additional power in specific parts of the lens for clear vision at all distances, but bifocal or progressive addition lenses may be prescribed if you’re over 40.Your eye doctor may prescribe special soft contact lenses that bend light in the correct direction, but you may need gas-permeable rigid contact lenses if you have severe astigmatism. However, both glasses and lenses can be uncomfortable and inconvenient for many people, and neither can correct astigmatism completely. LASIK or laser in situ keratomileusis is a form of laser eye surgery conducted to remove the underlying flap of the cornea. It corrects vision by refracting or bending light entering the eye, and is often preferred over other refractive surgeries since it only removes tissue from the inner layer of the cornea.In the past, LASIK was considered ineffective for correcting astigmatism completely. With modern advances in technology and eye surgery methods, however, this laser guided treatment can treat astigmatism as well as other vision problems such as nearsightedness and farsightedness, eliminating the need for glasses or contacts. Astigmatism may also be treated with orthokeratology, or ortho-k, where a series of rigid contact lenses are fitted over the eye to reshape the cornea. You need to wear these retainer lenses for a specified period of time, usually overnight, before removing them. Ortho-k can improve vision in moderate cases, but only if you continue wearing the lenses. If you stop wearing them, your vision can return to the original condition. Other options include photorefractive keratectomy or PRK, a form of eye surgery where tissue is removed from the cornea’s superficial and inner layers. Today, LASIK is one of the most popular choices for permanent and practically painless vision correction. Of course, the right treatment choice depends upon the degree of astigmatism, health of your retina and cornea, as well as your lifestyle and vision needs. Your eye doctor can help you choose what’s right. 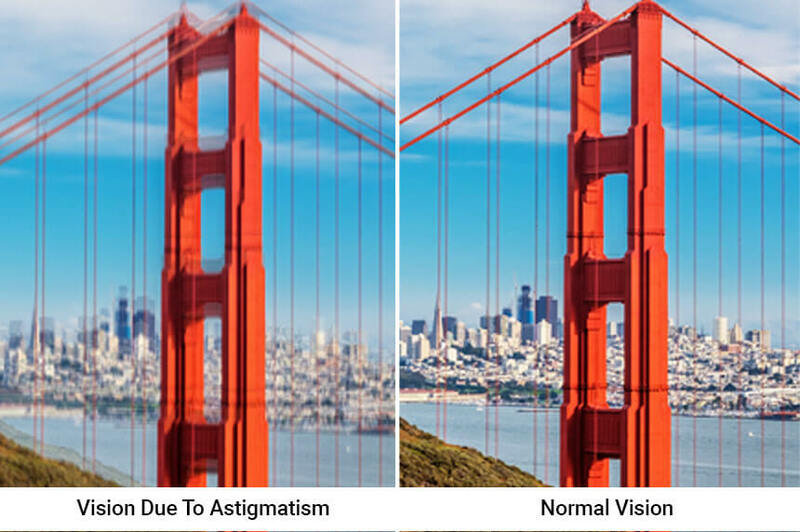 To learn more about astigmatism treatment or to book an appointment for LASIK in Fresno, contact Insight Vision Center today!